The activity, in brief: Hold up a big sign, visible to passing motorists, beside a main street, at some times when a lot of traffic is going by. You can do this alone (perhaps waving to motorists) or with several of your friends (probably while chatting). You must live near enough to some road that carries a lot of traffic — e.g., you must live in or near a town of moderate size or larger. If you live out in the middle of nowhere, this activity probably isn’t for you. Your schedule must permit you to engage in this activity at a time when there is a fair amount of traffic on the road. For instance, during afternoon rush hour, when most people are driving home, would be an ideal time. Students and retired people often are able to fit this kind of activity into their schedule. You’ll need to make a sign. More about that below. Reasons WHY you might do this activity: It’s free, except of course for your time and the price of the sign materials. You can say whatever you want, within a few constraints mentioned in this article (e.g., your message needs to be fairly short). And you will be addressing a random cross-section of society — unlike most other methods of political messaging, which end up mostly just preaching to the choir. A sign held by a live person gets more attention than a billboard. The presence of the live person means that someone has attached enough importance to this matter to give their time to it. A sign that requests honks has this extra advantage: It may help to break the inertia. It may make people feel more involved, and thus cross the threshold from spectator to participant. Also, when a motorist hears another motorist honking, then the movement is represented by more than just the person holding up the sign. and of course there are more gradations possible. Your sign is not going to move people all the way from one end of the spectrum to the other end, but perhaps it will help in moving people part of the way from one gradation to the next. Some political changes are not visible at first; they are below the surface, in people’s minds. They build there, until they burst forth into the light. — Political journalist Chris Hedges is fond of telling a story of the fall of the Berlin Wall. He was in Berlin, talking with leading activists. He asked whether they thought the wall would come down someday. They said yes, perhaps within a year or two, but they couldn’t be sure of when. And those were the people who would be most “expert” on that subject. It came down the next day. You can’t see some of these things coming, until they come. Never underestimate the impact of even a small number of people doing something. It means thousands of others who see it, who hear about it, now have a more realistic feeling about such a thing. It may take them several more months or years before they ever [join in]. But the possibility of their going just got a little more real when they see you standing there doing it. It’s not as strange, it’s not as hopeless, it’s not as impossible, because it’s been realized by another person who’s not so different from them. What should the sign say? Obviously, that’s up to you, but here are a few things to think about. Passing motorists will only have a second or two to see your sign, so it probably should be a very small number of very short words, printed in large letters. Probably. But I won’t insist on that. If you’re going to be standing near a traffic light, where motorists will be halting, perhaps you can afford a slightly more complex statement. You might think about whether you want your sign to be agreeable or confrontational. 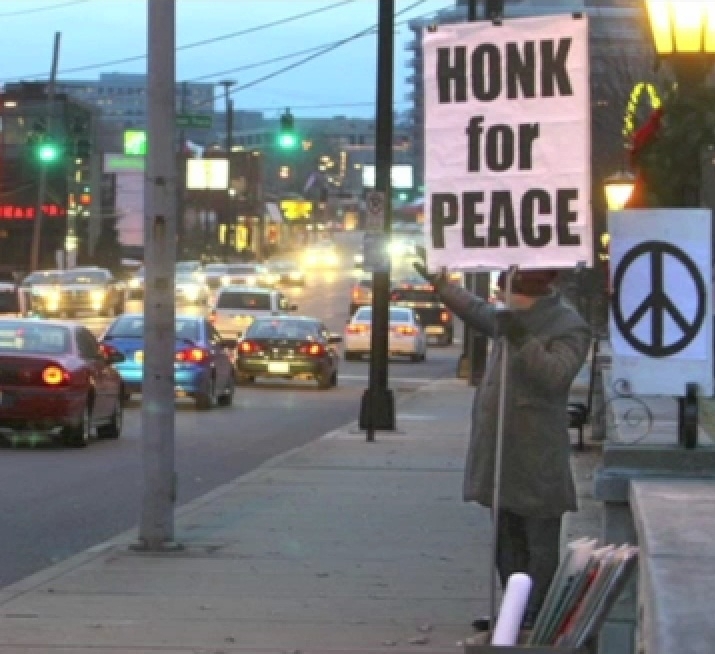 I used to like “honk for peace” because it’s a statement everyone can easily agree with, but eventually I grew to dislike it for the same reason — i.e., because it’s a statement everyone can easily agree with; I’d rather hold up something more controversial and thought-provoking. And keep in mind that our warmonger-in-chief received the Nobel Peace Prize, and that World War I was called the “war to end war.” Evidently, saying you want to end war doesn’t say much. One of my friends suggested a sign that says “consume less, share more.” But I didn’t like that one either. It’s not confrontational enough. No matter how much or how little people are consuming or sharing, they can say to themselves “I am consuming less; I am sharing more.” Less than what? More than what? They can look at your sign, and smugly tell themselves that they are in agreement with it, and not be changed at all. I would rather have a sign that makes people think, a sign that some people will disagree with. Lately I’ve been using more signs that attack capitalism. Ultimately, the most important rule in choosing what to write on your sign is this: It has to be a statement that inspires you enough so that you’ll actually want to hold the sign for other people to see. That rule trumps all the other rules. If you’re not inspired, you’re not going to use the sign for very long. If you tire of a sign, make a new one. Or, for that matter, a motorist who sees just the word “capitalism” will conclude that I am complaining against capitalism. After all, the word is hardly ever used in any other context. People who are in favor of capitalism may debate among themselves about which kind of capitalism is best — e.g., more stimulus, or more austerity — but they are only looking at different places inside the box, and they are not looking outside the box, and so they don’t need a word to describe the box — they don’t even notice they’re inside a box. So someone who sees me complaining against capitalism might give the matter a moment’s thought: “are any alternatives to capitalism possible? Is capitalism good or bad, on the whole? Has it lived up to its promises?” I’d like to get more people thinking about those questions. You’ll accomplish something useful even if the motorist doesn’t have time to read your sign at all. Even in that case, the motorist will still be made aware that someone is standing by the roadside with a protest sign — i.e., that someone is dissatisfied with our present conventional means of expressing grievances; someone feels that the system is not working. The most important criterion is to choose a spot where you’ll be visible to lots of people. Otherwise, there’s no point in bothering with the whole activity. If your vigil location is not withing walking distance of your home, then it needs to be within a short walk of some convenient parking space for yourself. (Or within a short walk of public transportation, if that’s how you roll.) Most stores, banks, and other businesses won’t object to your parking in their parking lot, but a few will — especially if the lot is nearly full, or if your sign is protesting against that business. Choose a location where you have a safe place to stand — e.g., a decent-sized public sidewalk. You don’t want to be standing in the road, or on the shoulder of the road — that would be unsafe (and might not be allowed by the police). Some privately owned sidewalks look just like public sidewalks — e.g., in front of a shopping mall. If you’re standing there, some representative of the business may come out to chase you away. Personally, I don’t think it’s worth fighting about, but I know some people who would be glad to take the issue to court. That’s up to you to decide. But at least I’ve mentioned it, so now this possibility won’t catch you completely by surprise. Choose a location where the passing motorists are only involved in fairly simple tasks — e.g., in driving on a straight piece of road. If you choose a location where the motorists are involved in something more complicated — a turn, a merge, etc. — they may not be able to spare any attention for you. Worse, you might distract them enough to cause an accident. During some months, you may find that your roadside vigil is at nearly the same time as sunrise or sunset. If so, choose a location where you will be facing into the sun, not a location where your back is to the sun. Facing into the sun is a slight inconvenience for you, but it is an enormous inconvenience to the motorists who you’re asking to read your sign while they’re driving. A location with a traffic light has the extra advantage that motorists may be stopped for a moment, and may have a few seconds to kill while waiting for the light to change; then they have plenty of time to read your sign. I would exclude certain locations. For instance, if you hold up your sign near the entrance to a parking lot for a big rock concert or a big football game, it will be seen by many people, but they are people who came there mainly for entertainment, i.e. to get their minds off serious matters. They may actually feel that it is inappropriate for you to hold up your sign in such a place, and so they may feel resentful, and be prejudiced against your message. At least, that is my guess; I could be wrong about that. (Let me know if you think otherwise.) I think there will be no such resentment along major streets, because motorists are used to driving past all sorts of advertisements. Some people like to bring along a radio or a portable music player, for entertainment during the vigil. Personally, I don’t care to do that. I’d rather give my full attention to the passing motorists, so that my facial expressions will add to the sign. On weekdays, rush hour is a good time to have lots of visibility, if your schedule can accommodate that. Usually that’s between 4pm and 5:30pm. On weekends, there is no rush hour, but you might want to stand near a shopping center during peak shopping hours, around 2pm. Lately I’ve made each of my vigils an hour long — no more and no less — because I don’t want to tire myself out and lose interest in the activity. If the weather is hot, use sunscreen and bring a water bottle. If the weather is cold, bring more layers of clothing than you think you’ll need — you can always remove a layer of clothing that you’ve brought, but you can’t add layers that you haven’t brought. If the weather is wet, bring your biggest umbrella, and use a sign small enough to fit under the umbrella (or use a waterproof sign, but that may be harder to prepare). You get extra points for demonstrating in bad weather — i.e., some motorists will be extra impressed to see you there. But I often skip the vigil if it’s raining, because rain tends to destroy my signs pretty quickly. Designing the sign. I design signs that I can re-use many times. (And so I am more likely to skip days when it’s raining, because rain tears up my signs pretty quickly.) My handwriting isn’t neat enough to satisfy me, so I prefer to use my computer to print out on 8.5 x 11 sheets of paper, and then tape them together. I attach the big paper sign to a piece of posterboard using binder clips, so that later I can easily switch paper signs but re-use the posterboard. 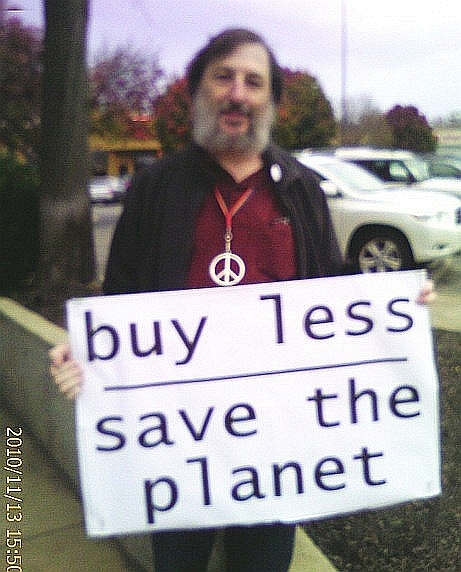 Use a bold font, such as “Impact.” A lighter weight font may still be readable from a distance, but not quite so easily, as you can see in the “buy less” sign that I made for holding up near a shopping mall during November and December. Put the sign on a pole, so that you can rest the weight on the ground rather than support it entirely with your own muscle. I use the empty cardboard roll from paper towels as a pole sleeve which I attach to the back of the poster board, so that I can easily remove the pole when I’m packing up to go home. My pole disassembles into two parts, and my biggest sign folds up, to fit into my small car. Here is a faster method for making signs, that some people prefer: Design your sign on a computer. Then use a projector, to project the image onto some blank cardboard. Use paint to fill in the letters where they are projected. If you’re not doing any fancy graphics, you can make a sign very quickly this way. Some people like to use cheap (e.g., discarded) cardboard, and make lots of disposable signs in this fashion. Place it and leave it. Rather than hold up a sign, some people like to just leave a sign where it will be seen by lots of passing motorists. This technique was used by “The Freeway Blogger.” Of course, the police will come and remove the sign after a while — perhaps after an hour or two — but that’s okay if you considered the sign disposable. If you’ve picked a good location, lots of motorists will see the sign before then. Originally published 2012 March 18. Addendum 28 Feb 2016. While I was holding up this sign, one passerby yelled “you need a bigger sign.” I think he was almost right, but not quite. There was a bit of wind on this day, and a bigger sign would have been hard to handle. What I really needed was a sign on the same size board, but with fewer words, in bigger letters — e.g., “Mrs. Clinton: LIBYA? BANKERS?” The passing motorists were going around 35 miles per hour, and didn’t have time to read more words than that.